Independence. Convenience. Mobility. Your lifetime Handy Cane. Handy Cane is a strong, lightweight walking cane that is built for a lifetime. It's made from materials like aircraft grade aluminum, stainless steel and space age plastics. The Handy Cane is not just an elegant cane; it is also a versatile and easy-to-use grabber. It can help you pick up and grab things like a pair of key on the ground, a book high on a shelf, a heavy bottle of wine or even a dime. This is the perfect gift for friends or loved ones who are recovering from surgery, have a physical disability or are limited in mobility due to their age. GoingClear Interactive was responsible for the design and development of the new Handy Cane website. The website features high-resolution photography, clean use of typography throughout and multiple visual call-to-actions for users to buy the product. We placed a large focus on the eCommerce solution for the client and went the extra step of customizing the look and feel of the cart and checkout pages to tie everything together. Other features include an animated cane graphic on the Home page, a blog archive, and a search filter for the FAQ page. 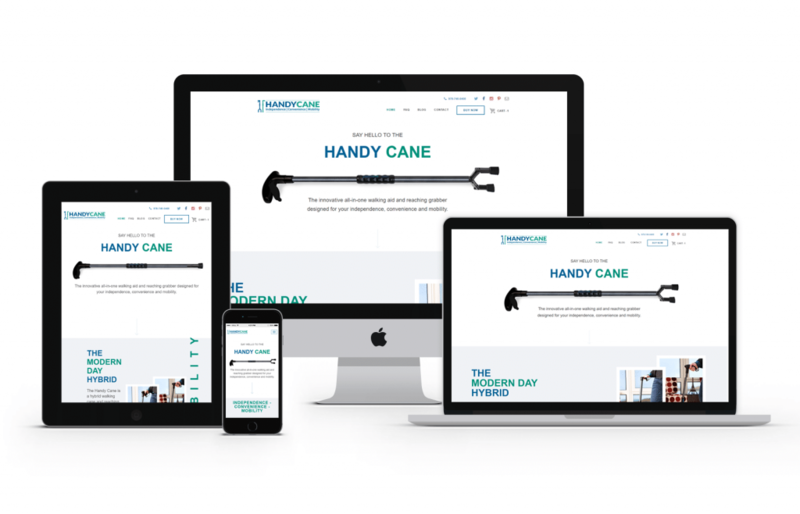 The new Handy Cane website was built using WordPress as the CMS (Content Management System) along with a fully mobile and tablet friendly design leveraging Twitter Bootstrap for the responsive framework so visitors will have a flawless experience on any device. Now that's handy!